In a medium skillet, melt the butter over medium heat. Whisk in the flour and cook, whisking frequently until the mixture boils. Whisk together the heavy cream and egg yolks. Add to the skillet and lower the heat to medium-low. Add the sherry to the skillet as well. Cook, whisking constantly, until thickened -- 5-7 minutes. Whisk in the paprika, nutmeg, salt and pepper. Taste and adjust seasoning as required. Stir in the lobster and remove from heat. Let sit for 3-4 minutes to warm the meat. Serve over toast rounds or biscuits. Spending summers in New England as a child, lobster was a required tradition. A treat that made vibrant red appearances at family reunions and special summertime dinners. But until last year, the only way I ever ate lobster was with drawn butter -- either straight from the shell, cracked and removed by me, or in a buttered hot dog roll Connecticut style. But last fall when I was in Cape Cod, I had lobster prepared a different way for the first time ever. It was served in a creamy sauce with a buttery crumble topping, as a pot pie. And oh my, was it good. No, it was better than good. It was freakin’ amazing. I came home from that trip dying to make it myself. Immediately I started researching the recipe, until I found one that was really similar. I haven’t made that yet, but I discovered that Lobster Newberg was somewhat similar -- and without a couple of the steps involved in making a Lobster Pot Pie. 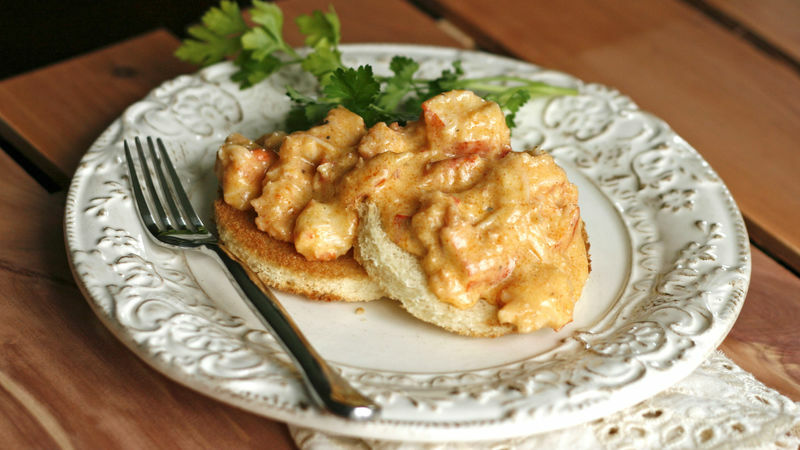 Lobster Newberg has chunks of lobster served in a creamy, buttery sauce over toast. It’s decadent and mouthwatering -- and best of all, it only takes about 25 minutes to make. My version is mild, but traditionally Lobster Newberg has a bite to it thanks to the inclusion of cayenne pepper. If you want yours to have that bite, skip the paprika and add cayenne instead. So, where’d this dish come from? Sometimes spelled Lobster Newburg (like the New York town), Lobster Newberg is believed to have first been served at the famed Delmonico’s in New York. It was named for a wealthy sea captain Ben Wenberg (Newberg is an anagram of Wenberg), who introduced the dish to the restaurant after a voyage. Or so the legend goes. Want to switch it up a bit? Serve over Pillsbury Simply Biscuits. They’ll sop up the sauce and make it easy to get every last drop. YUM! Has lobster piqued your interest? Learn how to cook lobster the traditional way in this How to Steam a Lobster guide. Do you make lobster at home?